This machine has employed new and innovative approaches which conventional leak testers do not possess. Operators no longer need to set test pressure with a regulator. It will automatically set the pressure once necessary information is entered. It is equipped with a regulator to allow manual pressure setting as well. It also offers various intelligent functions. The parameter setting enables the graphic display of air pressure charging status as picture shown beside. Best suitable for both low-volume multi product and high-volume single product. 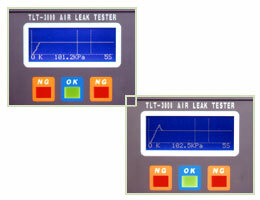 Unbelievable price on Air Leak Tester TLT-3000/TLT-3000A in Seremban (Malaysia) company Bestever Enterprise.